I was really excited to receive a review copy of Motivate Your Child by Dr. Scott Turansky and Joanne Miller. I have recently struggled in parenting one of my sons who seems to struggle with staying on task and is often down right squirrelly. He is a great kid, and so very smart, but I feel his spirit is being crushed by the behavior chart at school. I need him to decide on his own to make good choices without me prodding him along during the day. Motivate Your Child is not necessarily aimed at children with attention deficit, but there is plenty of advice and guidance within that I feel will be helpful in guiding my son. 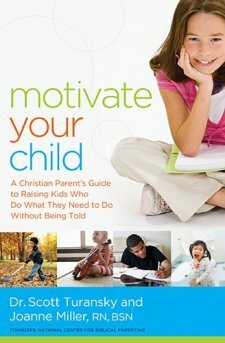 Motivate Your Child is a Christian parenting book, so know that most of the advice is with the direction of scripture. If you are a not a Christian, the advice given is still applicable. While I was excited to read the book for Part 1, Moral Development in Children, I enjoyed Part 2, Spiritual Development in Children much more. I loved the breakdown of Moses’ instructions into three principles for guiding our children: Build a relationship, share scripture, and practice faith. So simple, and at the same time, so profound! This book was written to help, not to entertain…so it is not a page turner in that respect. But an anxious parent ready for some change may find it too interesting to put down. I was given a complimentary copy of this by BookLookBloggers in exchange for an honest review. All opinions are my own and I have not been compensated.